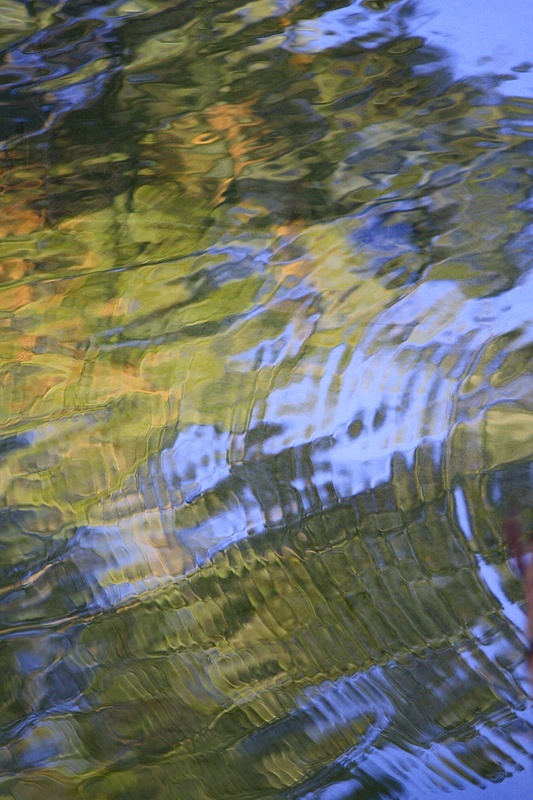 For a long while on a recent afternoon, I stood on the river’s edge mesmerized by the ripples and distortions of color reflected on the water. Between the light breeze and insects disturbing the surface, it was an endless show, like a constantly rotating exhibit at an Impressionist art museum. This entry was posted in Field Notes, My Photos and tagged art, Impressionist, insects, nature, nature photography, photography, reflections, ripples, river, water. Bookmark the permalink. Those “long whiles” ! What a lovely photo….. I could easily spend hours gazing upon those waters. Thanks, you know I had to tear myself away! I can see why you would be entranced. Your photo is truly beautiful. This is really beautiful Eliza. Mesmerizing. How wonderful that you have a place like this to visit. Thanks, it is a blessing, isn’t it? And just steps out my back door. I pinch myself constantly, grateful for this lovely place. Thanks, the thought had occurred to me! 🙂 Someday I’ll gather a collection and hold an exhibition! Thanks, Sophie, I’m glad you liked it! The pictures are wonderful. Thank you so sharing . I can understand you being mesmerised by the ripples! I think they would print out as a beautiful piece of fabric. I totally agree, Maureen! Imagine a wall hanging or bed quilt – gorgeous! Many thanks!